This kind of curry without Onion and Garlic is useful when we need to prepare some curry as offering (naivedyam) to God. I typically make this when we perform any puja at home. It is also a pleasant side dish to make when having guests over for an informal lunch/dinner. This is definitely a god send when the invitees don't eat onion and / or garlic. This curry goes well both with Roti and Rice. Thanks to my cousin, Mallika, for sharing this recipe! 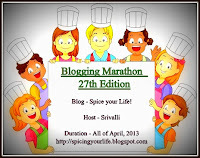 Check it out for Day 3 Week 1 of BM #27. In a wok/kadai, heat oil and prepare the seasoning by adding all the dals, cumin, mustard seeds and curry leaves. After the mustard seeds pop, add all the vegetables and turmeric. Cover and let the vegetables cook until tender (about 12-15 min). Meanwhile, grind all the ingredients listed under 'to grind' to a fine paste. Add this paste to the partially cooked vegetables and let the flavors mix well. Also sprinkle salt to taste. Remove from fire and garnish with pomegranate seeds and / or coriander leaves. We definitely need some curry for those puja days and this looks delicious! Lovely medley of catchy vegetable curry, prefect side dish. sounds delicious and loved the pomegranate seeds for topping..
Super curry looks tempting n colorful!! Very colorful curry. Definitely a must for parties with non onion & garlic eating guests. Thanks for sharing. It is lovely to see how you have controlled the heat while cooking the veggies. Lovely color. Wow this is so delicious yet simple to make. I have forgotten to cook without onion and garlic so this is a thankful addition to my list. The poppy seeds and coconut will do the cover up operation for onion and garlic. We normally use nuts and khoya to make it Jain.